Our readers give helpful advice on setting up a refugium. A selection of useful tidbits of information for the aquarist. Readers are encouraged to send their tips to terry@advancedaquarist.com or to post them to our Hot Tips sticky in the Reefs.org General Reefkeeping Discussion forum for possible publication. Next month’s Hot Tip theme will be “Calcium Reactor Tips“. Ok, I guess I will start with the old standard. I am planning a sump/refugium combo out of an old 29 gallon. The tank will be baffled between the intake and the refugium with 3 baffles, and the output will have 2 baffles. Water from the overflow enters the first chamber where it is run through the skimmer. It then travels over/under/over into an 18″ x 12″ section of the tank acting as a refugium. The refugium section will contain 6″ of sand, live rock, and various forms of macroalgae, powered by a Lights of America shoplight rigged to a timer at opposite photoperiod from the main tank. As the water leaves the refugium section, it travels over/under and back into the main tank through a Dolphin pump. I’ve used tank dividers as baffles as well as to create different zones in my refugiums. e.g. 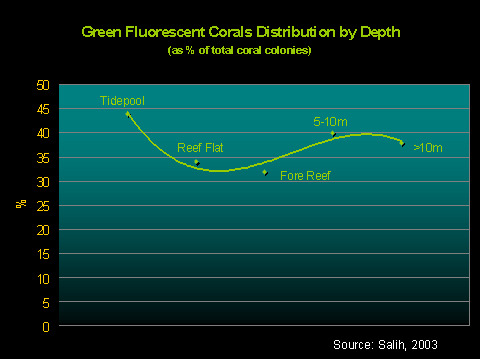 algae zone, rock zone, sand-only, crushed coral-only, etc. They’re pretty cheap and easy to adjust in case you want to enlarge one zone or shrink another. They’re also very easy to cut and adjust in case plans need to be changed either to miscalculations or new additions. I think chaetomorpha is the easiest macroalgae to grow and harvest with a refugium, but I also like growing gracilaria and caulerpa prolifera because the fish like eating those two types of macroalgaes. Mangroves are interesting, but you need some vertical area for them. I recently purchased some seagrasses to add some diversity to my refugium. I like lighting a refugium 24/7 because I feel it gives the macroalgae more light to outcompete the nuisance algae in the main tank where the light’s on only half a day. Rubbermaid sumps and refugiums work fine, but if you have the money, get a custom made acrylic sump/refugium for your setup since it really opens up your options on how you can use the sump/refugium. Lights of Ameria 65-watt light for refugium (hole has been cut out of light diffuser grate underneath the light), Euroreef CS 6-2, and overflow input behind skimmer. Note the effluent outflow from calcium reactor going through the light diffuser and into the refugium area. I recently set up an additional 50-gallon refugium for my setup that is fed by a Masterflex peristaltic pump so that only about 15-20 gallons a day flows between the refugium and the rest of the system. This was setup for additional nutrient export and greater vertical volume so that I can grow gracilaria. Set up your refugium as a display. I use a 15 gallon on the side of my 55. 60 gph is pumped into the refugium via a DIY surface skimmer, and the return is gravity fed back to the tank. I’ve got about 25 lbs of liverock and 20 lbs of oolitic sand. Various softies, various caulerpa, cheatomorpha, and mangroves. Quite a large amphipod and mysid population. Lit by a 175 watt 10k ushio. I like the idea of very low flow through the refugium combined with high flow in the tank. I feel this allows for more settling of detritus into the refugium. 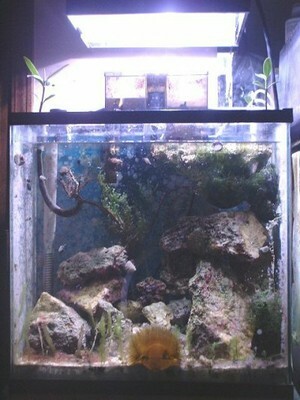 I had a custom 16 or so gallon acrylic fuge above my tank which fed back to the display via gravity. I had 6 peppermint shrimp in the fuge which were fed daily and spawned regularly, creating a lot of food- visibile juveniles- in the main tank. The whole set-up was designed around keeping a Mandarin, and it was fat and happy! I imagine the addition of planktonic food from the peppermint shrimp would benefit any set-up. Also, I am a big advocate of lighting the fuge on the reverse schedule(RDP) of the main tank- helps with ph stabilization yet still allows the needed dark phases of organisms’ metabolic processes. The best luck I ever had was one a 10g Dwarf Seahorse setup I had out in Cali. I had it connected to a 10g sump and it pumped up to a 10g fuge. 24/7 65w PC lighting w/ 5# LR suspended off bottom with eggcrate. I ran a 3.5 or so sandbed in the fuge with the inlet coming in between the sand bed and the LR table. The turnover was roughly 10 times an hour. The fuge gravity fed to the Seahorse tank. after the system stabilized I rarley fed the “Horsies”. The fuge produce a great deal of food. I hope one day to set up a fuge for my 29g with the same volume as the display. But space doesn’t allow it for now so I’ll have to settle with a 10g. IMHO the bigger the fuge the better.